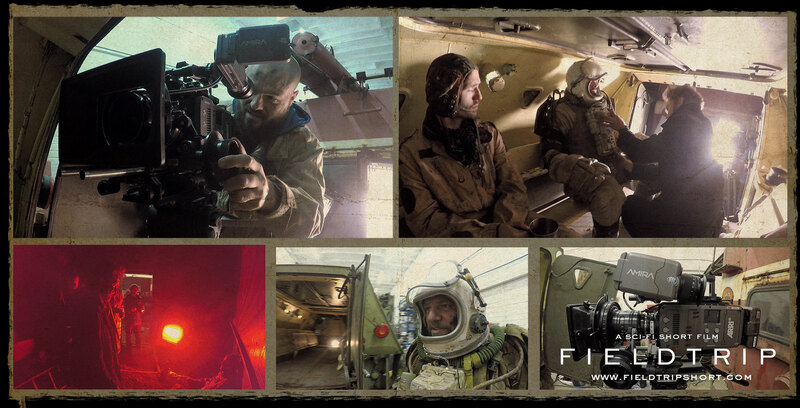 FIELDTRIP is a 25 minutes science fiction short movie about a man in a robotic spacesuit, who crashes in his own minefield and has to navigate through it. A dark comedy about the ‘collaboration’ of man and machine. An Engineer and soldier of The Old Homeland, ‘Q’ has spent 5 years side by side his fellow soldiers, on a foreign desolate planet, booby trapping it in an explosive minefield as ordered. Why? Because orders are orders. If you follow the orders The Old Homeland will be generous upon your return. 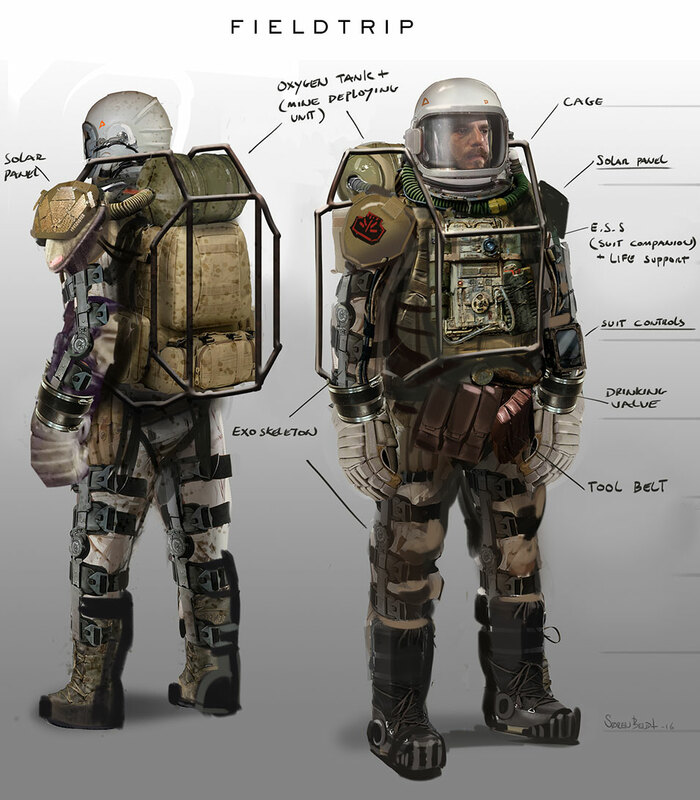 On the mission, Q is wearing an army issued EXO-SKELLETON space suit, inside it resides his A.I suit companion ‘ESS’. The Artificial Intelligence ESS is the heart of the suit itself, it provides motion assistance, self-regulates the suit systems, and is always there to help. As the soldiers are about to leave the planet, their ship explodes and after surviving the crash Q finds himself marooned in his own minefield – stuck inside his robotic space suit ESS. The suit damaged, time and oxygen running out, Q and ESS has to come up with a plan. ‘Q’ is played by Romanian actor Laurentiu Ciucur and the voice of ‘ESS’ will be female computer recordings. FIELDTRIP began 6 years ago when Paul Arion came back from Iceland with pictures of the stunning other-worldly landscapes. As close collaborators in their day jobs and huge fans of the 70’s & 80’s gritty science-fiction Paul Arion and Soren Bendt fell in love with the idea of a man in a spacesuit marooned in his own minefield, stuck inside a robotic space suit with a mind of its own. Their dream to shoot their short film in Iceland. 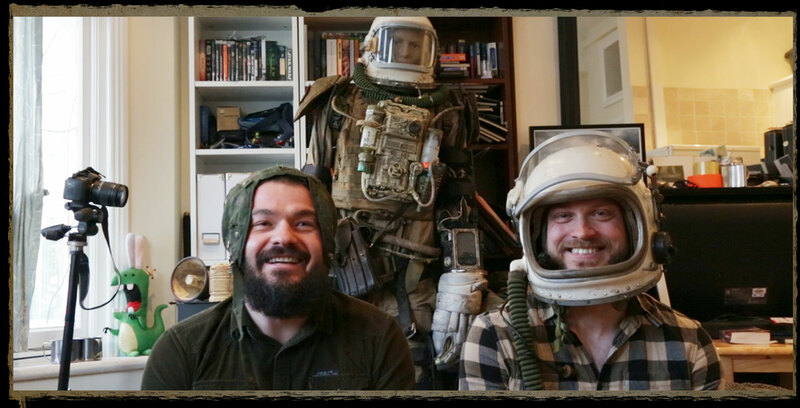 Working in their spare time, writing the script, drawing concept art and storyboards and researching the project, they build the space suit and all props in a small flat in London, out of their own pocket, and shot the first 4 minutes this year in the UK. Now they are set on going to Iceland to complete the movie and hope with help from backers on Kickstarter to make FIELDTRIP a reality. If you like our project, have a look at the FIELDTRIP Kickstarter page and see how you can help out! See how we’re making the movie. Come with us as we laugh and cry, facing the weather, the props breaking, the long hours and witness how we try to put all the shots in the can. Back our Kickstarter and get access to the FIELDTRIP video diary! Paul Arion and Soren Bendt are two film makers from the UK. They have combined 30 years of experience working on high end blockbuster movies, while making music videos and short films in their spare time. Soren Bendt is a Danish story board artist and film maker who wrote, animated, and directed the acclaimed short film ‘Hum’. His artwork has been featured in various books and films. Paul Arion is a Romanian Director of Photography and photographer who has created multiple short films and music videos. Copyright © 2017 Fieldtrip by Bendt-Arion - all rights reserved.